Today everything is in the cloud. 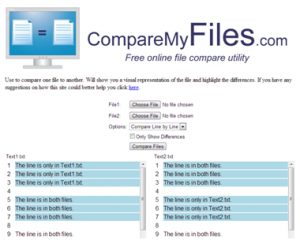 The file comparison tools are not an exception. Before on DiffUtils.com we were reviewing only desktop tools for file comparison, now it is time to start with services in the cloud. 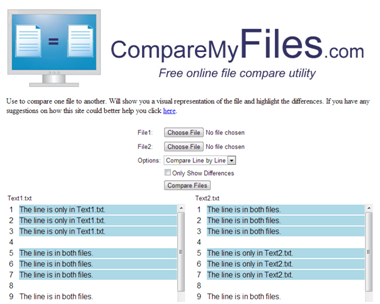 Before doing the review I was thinking about what a “dream tool” for online file compare might be. I wish I could use my tablet and choose files from my Dropbox account and have a comparison report in few seconds. The report could highlight all the difference between files, including the differences in formatting and it could take into account my personal preferences about ignoring some useless strings of text. Well, that dream is still a dream, but there are web-based tools with really nice features that you need to have in your toolkit. DiffNow – http://www.diffnow.com/ – supports documents of various formats – Editors Choice! Is created by PrestoSoft authors of ExamDiff Pro. A brief review shows that developers of ExamDiff Pro implemented in their web-based tool all of the features that are a must-have for file comparison. You will be able to upload a file from a local disk; the most popular file formats are supported. DiffNow provides an ability to create an account. With a registered account you will be able to keep your favorite compare settings online and save your reports. The company promises to introduce more features to its registered users soon. comparison of formatting (like bold or italic) text is not supported. if you will upload an MS Excel spreadsheet, you will not find original columns and rows as the document will be converted into plain text. During the test DiffNow worked properly in most cases. You might experience an error message, but reloading the page normally solves it. DiffNow supports documents up to 1 MB. DiffNow works on iPad, but it was a little bit slower than other tools that compare just plain texts. The tool is free to use and is monetized by a small banner of Google Adwords. Provides a plain interface with 2 text boxes. You cannot choose a file to upload, but you can copy and paste your text there. Results are displayed in 2 columns with good formatting where the differences are highlighted both as blocks and as specific words. An interesting feature is that you can choose if you want to store your compared results. If you choose to store your compared results for several hours or forever then the tool will generate a link for you, so you can use it later and share with your friends. Check out my compare results. The Diff Checker works on iPad. Texts for comparison can be pasted from the clipboard. An interesting feature is that 3 comparison reports are generated by the tool. One with changes marked inline with different colors, another with strike-out formatting used and the last one “Unified Representation,” that looks like a report that can be reused for further analysis of text by some computer algorithms. The tool allows working in copy-paste mode only generating nice-looking compared report as a result. A nice feature is that the tool allows sending compared results by email. Also, there are some manual functions for pre-processing of text, such as converting it to lower case or removing excess spaces. This tool allows choosing files for upload from a load disk, but unfortunately only plain text files are supported. The report is displayed in the small text boxes. The website is free as like the others and uses context ads for monetization.